Natalie Haythornthwaite goes for the block. 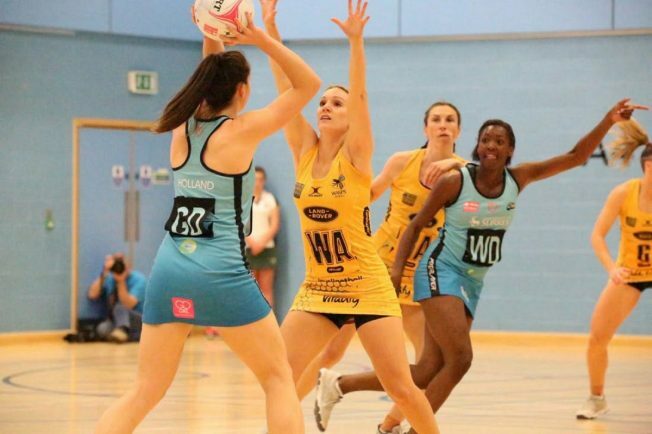 WASPS Netball took home the Tom Reseigh Trophy with a comfortable 63-36 win against Surrey Storm in the Vitality Superleague. Tamsin Greenway’s side controlled the game throughout to secure their 12th successive win and restore their lead at the top of the league to nine points. The game marked the second time Wasps and Surrey had competed for the Tom Reseigh Trophy, which honours the former Storm team manager who passed away in October 2016. Netball director Greenway praised her team’s ability to pull away from their opponents in the second half. “We pushed on through the game which is what I’m really pleased with after being held back a bit in the opening quarter,” she said. “Storm caused us trouble in the circle. “We knew they would be good in there but George Fisher starred under pressure yet again to give us an advantage. “We had lots of opportunities to take the game away and taking those is what we need to work on. “We showed late on we can put our foot down and pull away but we need to show that more often. “It’s a really special night to remember Tom. He was my team manager here at Storm and a good friend of mine. The visitors started the game in typically fast fashion, converting the first centre pass into a goal and immediately proving their attacking efficiency. Storm fired immediately back through shooter Sigi Burger, setting the tone for a fast paced goal-for-goal quarter. Wasps’ defenders Hannah Knights and Fran Williams pressured the South African Burger in the first quarter, forcing mistakes and leading to the black and gold team’s first significant lead of the game – ahead by four going into the second quarter. Storm introduced dynamic mid-court star Miki Austin after the change of ends, with both teams applying defensive pressure all over the court. But it was the visitors who responded best to the pressure and Greenway’s side started to take control, stretching their lead to nine by half-time. The hosts made wholesale changes at the break but were overwhelmed by Wasps at the start of the third quarter. Natalie Haythornthwaite was the catalyst in a series of slick attacking moves as her side continued to move away from the Surrey team, extending their lead to as many as 18. Storm showed signs of revival in the fourth quarter but they were short lived, as Wasps continued to grow their lead and secure the convincing victory. Wasps’ next home fixture sees them face Loughborough Lightning on Saturday.